Does this image even need a snarky caption? 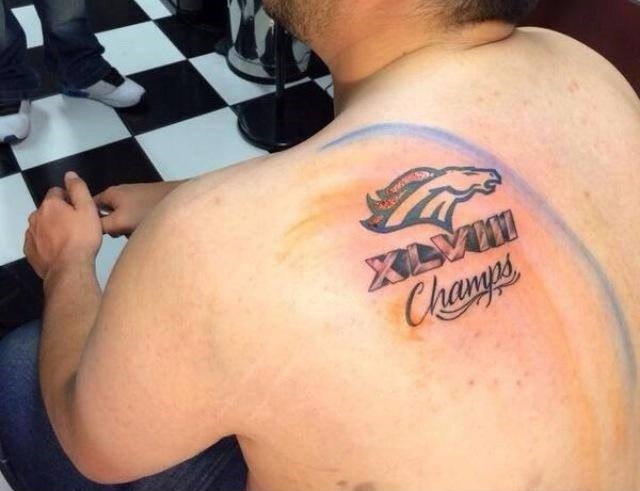 Not since Adolph Hitler’s “Victory In Russia” tattoo has there been a worse decision. Note: Napoleon had his tattoo removed while he was on Elba. Getting married to your 17th wife is probably not a good decision. I might understand 16 but 17? That’s crossing the line. Sixteenth times a charm. Isn’t that the saying? August. That’s a lot of bravado. Talk about a major “Oops.” Too funny. His second bad decision was posting it on social media before the game. 104,717 idiots have been here.